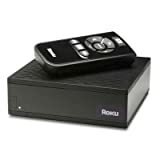 Roku player and Amazon Video On Demand , Amazon customers can: Watch new release movies, most on the same day they are available on DVD. Catch up on the latest episodes of popular TV shows such as House and The Office. Shop from Amazon's deep catalog of more than 40,000 videos without leaving the couch or paying a monthly subscription fee.